Sedum N. Amer. 563 1975. 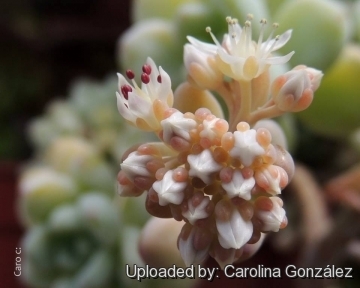 Origin and Habitat: Sedum clavatum is known only from one locality, the gorge of the Tiscalatengo River in the vicinity of Villa Guerrero an area in the Trans-Mexican Volcanic Belt at southeast of the Nevado de Toluca in the southern part of the state of Mexico. Habitat: It grows along the cliffs of the canyon. Rosettes: Compact, up to 5 cm wide tending to elongate to form long creeping stems in time. 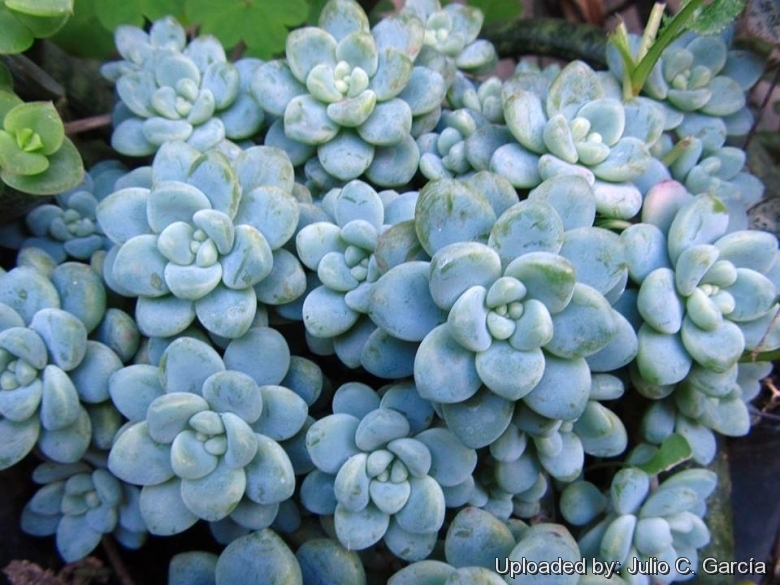 The stems lose their leaves as they lengthen but are usually covered by younger stems so the plant can look like a solid mat of attractive succulent frosty blue-green rosettes. The leaves are up to 25 mm long. Leaves: Glaucous papillose blue-green or milky bluish with hint of pink tinged on tips when in bright light or in cold weather, thick, clavate, upcurved, with short-spurred leaf blade bases. Inflorescence: Compact, short, emerging from the side of the stem a little below the growing tip, arching upward and not overtopping the rosettes by much. It has chubby bracts on the lower portion, looking much like miniature versions of the leaves, and ends in a tight cluster of flowers. Flowers: Small star-like, subtended by pink-tipped sepals, about 14 mm in diameter, white that take a pink hue with age. Blooming season: It comes into flower in the spring, blooming in mid to late spring to early summer. 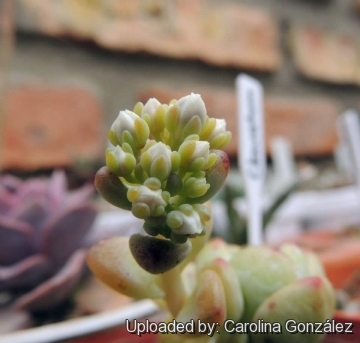 Cultivation and Propagation: Sedum clavatum grows as a small-scale ground-cover, branching and also making offsets from the base to form a clump which spreads outward over time. Great scrambler in the ground if soil is well-drained, especially trained over or around a rock, in a container planting or hanging basket. 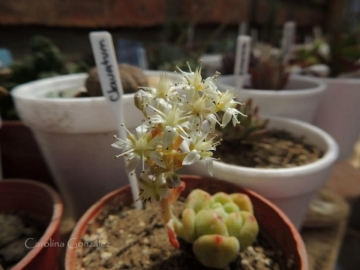 It is an easily grown succulent that can tolerate sun, shade, moist soils, dry soils, but looks its best only when given adequate light levels and water, and ideally should be grown outdoors in full sun. With its extreme drought resistance, S. clavatum needs only minimal care to reward you with its attractive texture. Exposure: It prefers light shade with ample airflow rather than full sun, except in cool coast-side locations. Bright light is required to prevent "stretching" of Sedums ("stretching" occurs when a moderately fast growing plant such as an Sedum, is grown in dim light or over-fertilized, which causes overly lush growth that contributes to weak, pallid plants). However, when moving plants from lower light conditions into full sun, be wary of sun scorch resulting from too rapid a transition into intense summer sunlight, most easily avoided by ensuring plants are well-watered before moving them on a cloudy day. Waterings: Sedums are able to tolerate extended dry periods and survive drought without the need for watering, but they will grow stronger if they receive adequate moisture during their growing season, but never allowing the plant to remain waterlogged (root rot sensitive). Avoid overhead watering under humid conditions, especially during winter. Soil: It is essential in cultivation to use a very porous soil, which will allow quick drainage. Sedums are shallow rooted plants, and therefore benefit from good levels of organic matter in the soil. Give it enough root space for optimum growth. Fertilization: Slow release fertilisers with a low to moderate nitrogen content incorporated into the potting mix are usually adequate for the spring and summer growing seasons of Sedums, and additional fertiliser applications would not normally be required until spring. Ventilation: Good air movement is important for minimising pest and disease risks, and avoiding excessive humidity in cool winter conditions is important to successfully growing Sedums in the nursery environment. Hardiness: Though not terrifically cold-hardy, it can take overnight temperatures to -3 C however, the ideal temperature range during the summer growing season is 5-25°C, with the cooler autumn temperatures tending to make their foliage colours become more intense than those of the active summer growing season. 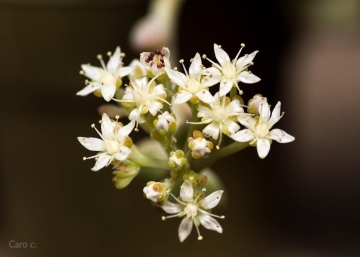 Pests and diseases: Aphids like this plant (and all flowering sedums). Uses: It is cultivated as an ornamental plant, it makes a superb container plant in frost-prone areas and can be an attractive part of rock gardens between stepping stones or in wall niches in frost-free localities. Maintenance: The seed heads will remain on this summer to fall blooming plant. Removing them will not keep the plant blooming longer. Many people consider the seed heads to be attractive and will allow them to remain on the plant throughout the winter before removing them as part of their garden spring cleaning. Propagation: It is easily propagated by cuttings in the spring. When the stem becomes too tall, just cut the top rosette with a piece of stem and plant it. It will soon take root, while the plant left with just the stem will soon grow new buds that can be in turn used for propagation. Time to take cuttings: April to July. New plants may be grown from leaves (or beans) that drop off or are separated from the stem and laid on the soil. If the plant is repotted some of the bottom leaves can be removed, in order to attempt propagation. However some of the cuttings will dry out without producing a plantlet.